If the heart is good, which religion is bad? A good heart finds Divinity on its own and is able to follow it. The problem with your religions is that they make more towards mind than towards the heart. They cannot go through the dam of beliefs and enter the field of love. Faith is the domain of the mind and is only a transitional stage. It may be dangerous for you if it includes misconceptions. Faith is not as important as love for the Divine is. And you cannot equate one with the other. You fancy cultivating faith, you develop it, but at the same time you get lost in its labyrinths. The heart that knows love knows where to find the Light and in inspired moments is able to show you the right way. Put love, not faith, in the first place. Turn to Divinity for help in this. For hundreds of years you have been deepening the mistake of trying to understand and grasp Divinity with the mind. But contact with the Creator, the most loving Being in the universe comes through the heart, through love which flows toward Him and in response Love comes back multiplied. Beyond doctrines, there is living and loving Light, the Lightness of the Universe. It has been waiting for you for years. Do not think anything negative about others, about other religions or about your own. Treat them as a part of the way to the highest values, as a result of efforts, of attempts to find the Light and to reconcile with it. These attempts mostly have failed in the Western world, but you also learn from mistakes. Mistakes are Divine gift and a blessing also, since eventually they lead you toward the higher good. God did not make a mistake giving you religion. Religion is only a signpost. Do continue to go free from its burden. What would you say of a man who sets off on an expedition and carries a signpost on his back? Is this a reasonable action? If you have already seen the goal, leave behind everything that burdens you, forget about attachments, forget about all the past and move freely into the arms of the loving Creator. It is now that this time comes on the Earth. Religion is love covered by the patina of the mind. You suffered looking for love and contact with Divinity and therefore you created your collections of beliefs. Put them aside for the moment. 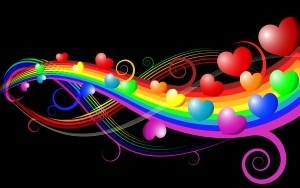 Now find love and turn toward it with all your heart and mind. It is so simple! Love for Divinity is the highest form of religious activity. Thank you, Master, for your wonderful words of love. Now I will never look down at religion as something negative and unnecessary. Do not look at religion. Do not think about it. Think of God and His love. Do not think about the world. Do not think about others. Do not think about the past. Do not bind yourself to the future. These are mind plays. What counts is only loving Divinity. Put Love in the first place, and it will arrange everything its way. There is only Love. Only love is there. These are not empty words. This is one of the greatest Spiritual Truths of the Universe. Devotee: Swami, how should we relate to the world? Master, for the last few days I can hear You saying that Zen Buddhism – in which I was interested in my youth – brought much negativity into my life. Could you tell something more about it? I have always thought that this was very positive period. Especially in the beginning when I meditated individually. Yes and no. Yes, because that practice directed your attention to spiritual matters and you eventually allowed yourself to become convinced that there exists something more besides the outer world. No, because you absorbed, utterly unnecessarily, masses of the outer energies burdening and narrowing your spiritual perception. Spirituality is a delicate matter. Everyone is different and everyone perceives it differently. There is no single solution or single vision that would be good for all. Zen Buddhism, if it is not taught by a devoted person filled with love, is more an obstacle to development than help. Much the same concerns most of your spiritual paths. These are pure theories, with very, very little of love. However spirituality is nothing but love – love for the Creator in His personal or impersonal form. Many spiritual schools claim, perhaps not without reason, that for success on a spiritual path it is most important to have a living master. Yes, and there is a lot of truth in this claim. If you are setting out for unknown mountains and you want with certainty and without any risk to climb the summit you may need a good guide that will show you the path. Thank you for this tip. But there is this gut feeling within me that You have earlier said that we do not need guides and masters. I do not want to be impolite, but in this case there is a small problem. I will answer thusly. Face up to it yourselves. You already are able to. Start thinking, begin to associate, listen to the meaning hidden behind answers. 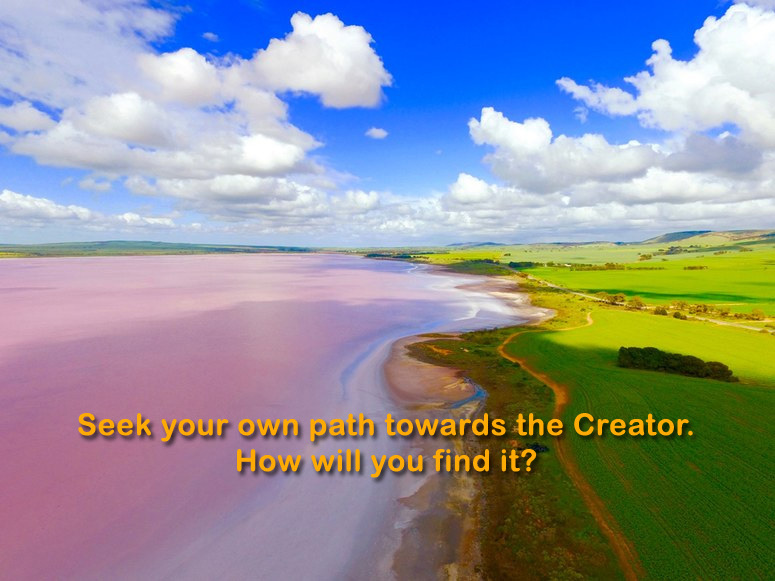 Seek your own path towards the Creator. How will you find it? Answer me. Love, prayer, requests to You will surely help us. I hope that the reader himself, and not you, will answer me. What will he do to find the conclusive answer to whether a master is needed or not? Dear reader, put reading off for five minutes and find the answer. How will you do it? The answer is below, but for the moment do not look in there. Think and find it yourself. What will you do? Take a five minutes break. This little exercise will give you a lot, much more than just reading. Do you need a master or you do not? It is a beautiful idea for boosting unaided thinking. Now write down the answer. You can find the answer by directing a request, prayer, love to the Creator who Is. The answer will refer to you and is valid for the present time. You may need a teacher and guide, or you may not. The final answer for yourself you will find in God, and only in Him. Ask that He becomes your Guide and Teacher. Do you have my answer? Do not get discouraged; keep working until you receive it. I always answer important questions. I answer to all prayers. Having learned and knowing how to apply the method, practice it as frequently as possible. Sai Baba: See God in every one you meet; see God in everything you handle. Live together, revere each other; let not the seeds of envy and hate grow and choke the clear stream of Love. Be in the world, but do not let the world into you. People ask me how I talk with You, how it looks from the “technical” point of view. Forget about technique. It never brings love. Talk about Love, about what flows from it, about what it can and wants to give people. Talk about love and you will never blunder. Love will burn away everything within you that separates you from it. With time it will take everyone in its embrace and will accomplish a profound transformation of the hearts and minds. This, and not techniques, is the way to hearing the voice of Divinity. Master, but can I just simply tell how I do it, how it happens, that your words appear on paper? Can I describe this process? No. It does not matter. What counts is Love. Make your way towards Love, and not towards technical solutions. Hearing or recording my words is just one of many skills a man acquires on the way to God. Do not stop on this. Do not follow the curiosity of mind which looks for interesting ways of spending time while the main objective of the journey is still far in front of you. Go. The proximity of Love, the Creator-who-loves-you is far more important than any spiritual technique. You said that You answer all prayers. This is a pretty revolutionary statement. Public awareness sees it differently. I want to stress it and say with great emphasis: God answers all prayers. However, a good father does not give you everything that you are asking for because fulfilment of your immediate requests could harm you. I give good things. Love, support, relief in sufferings, freedom from attachments, happiness and joy, enthusiasm for following the spiritual way, motivation for meditation, good events and phenomena. All this I do bearing in mind the good of others, the opportunity of making next step towards Love and towards all good states and qualities. I respond to each prayer – each one. Sometimes it has to take time because a situation needs to be prepared. Sometimes people need to mature to a gift. I reward every turn to God. The very fact that you ask and pray is the reason for an award. Be happy as I am.